A plumbing checkup should be among your top priorities when preparing your home for sale in Ann Arbor. Potential buyers walking through your home might flush toilets, turn on faucets and inspect your shower-heads. Seasoned “experts” will also take a look under the cabinets for leaks and check for water spots around key areas. The last thing you want is to drench a buyer’s enthusiasm because you didn’t fix a simple plumbing issue. A leak is the last thing you want a potential buyer to see. Major plumbing renovations may be huge selling points, but many homeowners can get as much credit by simply fixing any leaks throughout the house. If you can’t make repairs yourself, invest in a reputable plumber. The costs of fixing these leaks will be significantly less than the cost of stalling your home sale. Before allowing prospective buyers into your home, make sure you have strong water pressure and that there are no stains on any of the porcelain. If you do nothing else, take care of any leaks in your plumbing system, as these will be instant deterrents for buyers. Check as much of your plumbing as possible for corrosion or rust. If your house has more than one story, a smart buyer will look at ceilings for water stains from leaking pipes. Paint over ceiling stains on all floors to ensure buyers will see the same level of beauty in your home as you. Fingerprints and toothpaste stains are the bane of a clean bathroom. Prospective homeowners tend to focus on places where they can use their hands, so making sure your sinks look good is important. If your hot and cold water knobs aren’t easy to turn or if they are installed on opposite sides, buyers will see this as another task for them to fix. The last thing you want buyers to see is toothpaste stains and splash marks all over your sink. 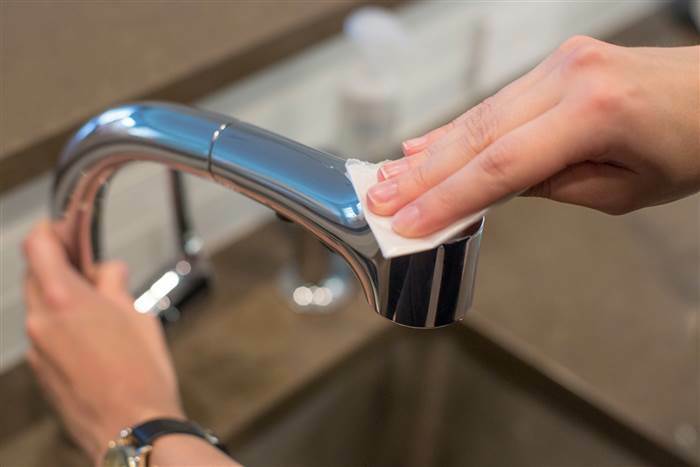 Wipe down your sinks and consider polishing your spouts, handles and drains. This little touch-up can make your old sinks look close to brand new. Make sure that your tub and sinks drain easily. Nobody wants to wait 10 minutes for the bath to drain. Take a look to see if your drain needs to be cleared before scheduling any showings. Finally, updated fixtures catch the eye of prospective buyers. If you are looking to really wow your potential buyers, invest in replacing all of your faucets with brand new installations. Not only will your new fixtures stand out to your buyers, but they can also increase the value of your home.